We evaluate all displays by performing extensive side-by-side viewing tests using a large library of challenging test photos and test patterns, together with a calibrated professional studio monitor that acts as a standard reference for image colors, contrast, and intensity scales. It is quite difficult to accurately convey this over the web using screen shots because that brings into the process a camera and your unknown display - both of which introduce their own inaccuracies and artifacts. None-the-less we provide below a simple demonstration using a photo that works relatively well under these circumstances: Purple Flowers, which emphasizes the differences in the Red to Blue Line of Purples in the Color Gamut. We downloaded this photo into the iPads and iPhone 4 and took screen shots of each of them using a Nikon D90 DSLR camera. Note how different they appear due to the significant differences in the Color Gamut and calibration of the displays. 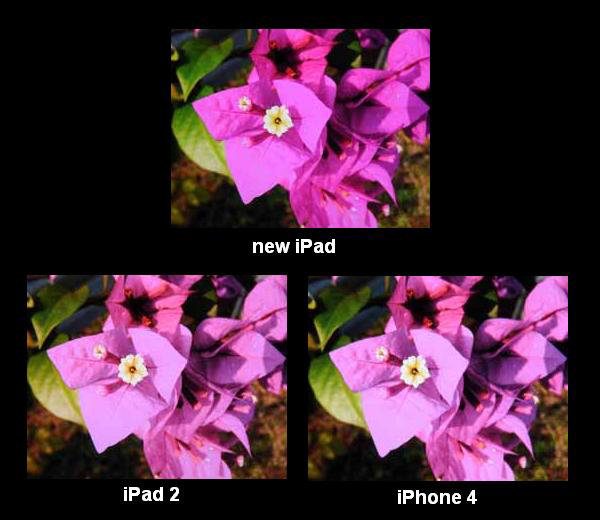 The flowers on the new iPad appear a beautiful and rich purple, while the iPad 2 and iPhone 4 flowers look dull and faded.